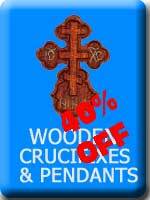 Hand-carved wood crosses/crucifixes. The perfect Ukrainian Gift for Orthodox, Catholic/Eastern Rite and all Christian faiths. These pieces are handmade in the Carpathian Mountains of Western Ukraine. Some have a small hole in the back for hanging. Coatings or finish is unknown. Traditional Crosses for your home from Ukraine.